Think back to when you were a kid and you went to the toy store. There might have been one or two particular items you really wanted to check out, but half the fun came from wandering around and taking in everything in front of you. It was exciting, you were exploring, and your senses hit overload. 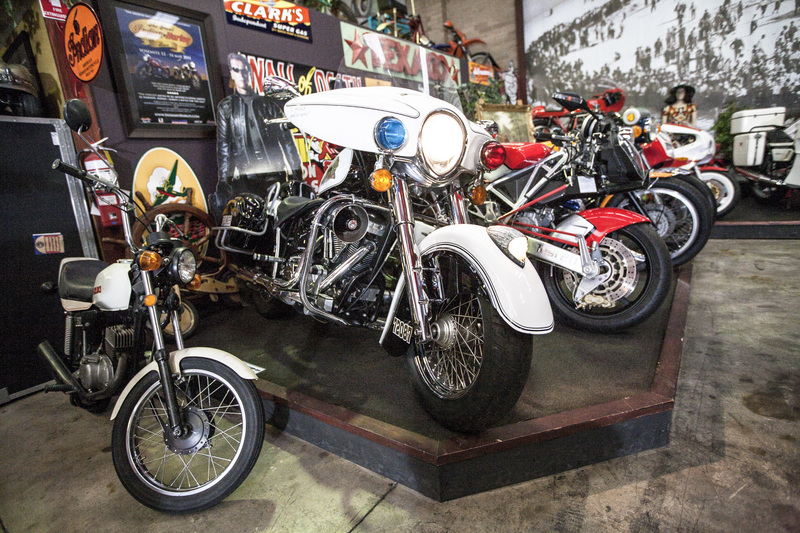 If you’re looking for that feeling again, then a trip to Antique Motorcycles might be calling your name. You don’t even have to be a motorcycle fan to enjoy it – in fact, it’s probably better if you’re not because then you’re less likely to want to take one home. That said… you’ll probably still want one. The pictures with this article will give you some idea, but to see it in person is an entirely different thing. 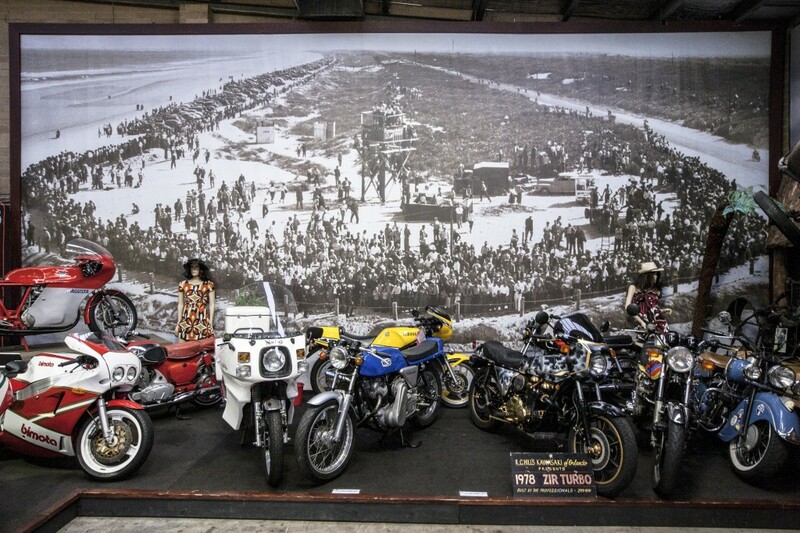 It is an enormous space filled with bikes, old advertising signage, neon lights, petrol bowsers, murals on the wall, display cases of models and toys, related paraphernalia, a pool table, a cafe… it goes on and on. 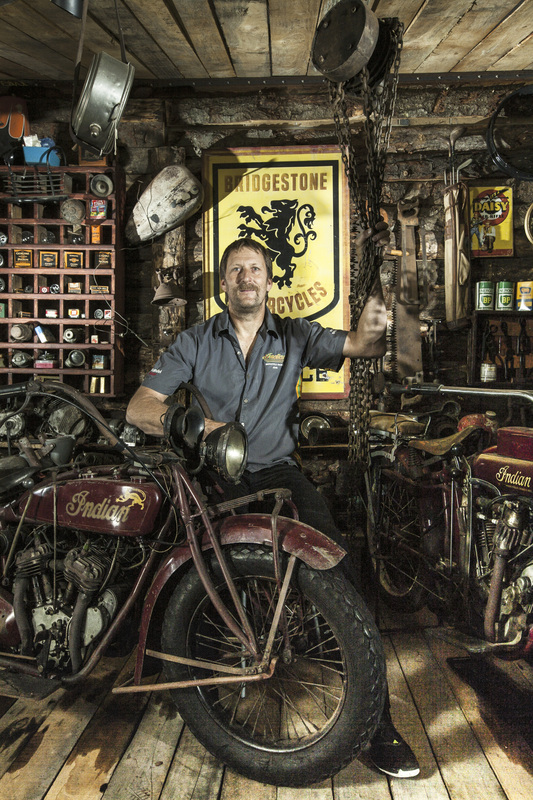 John Straw amongst his impressive collection of motorbike paraphernalia. You could spend hours wandering around and see something different every time. And even if you thought you had a handle on it, you could come back in a month’s time and find a whole lot of new items have been added. This is in addition to the fact that the displays are constantly moved around. Furthermore, for anyone who has wandered around any sort of antique shop – be it motorcycles, furniture, bric-a-brac or anything else – here’s the best part: the showroom is perfectly clean. I don’t say that flippantly either. For one thing, it is a massive effort to keep that many items in such a large space so neat and clean, but also it allows you to take in much more. 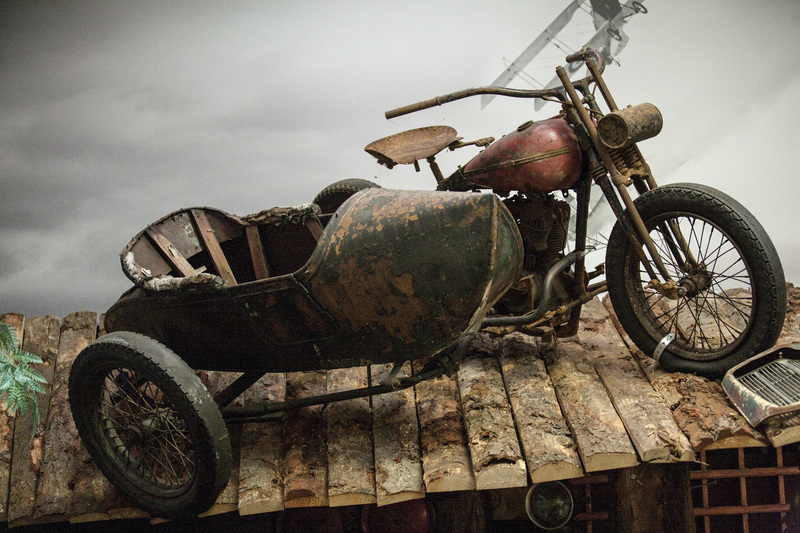 It’s about creating an experience and adding atmosphere to what is – at heart – a motorcycle shop. And that is exactly what owner John Gee set out to achieve. “I love the fact this place is always evolving,” says John. “That’s what gets me out of bed every day. You’ve got to have ambition and want to keep striving. The pictures with this article will give you some idea, but to see it in person is an entirely different thing. It’s a perfect blend of casual feel with professional engagement – so much so that you’d be forgiven for thinking that John has been doing this all of his life. 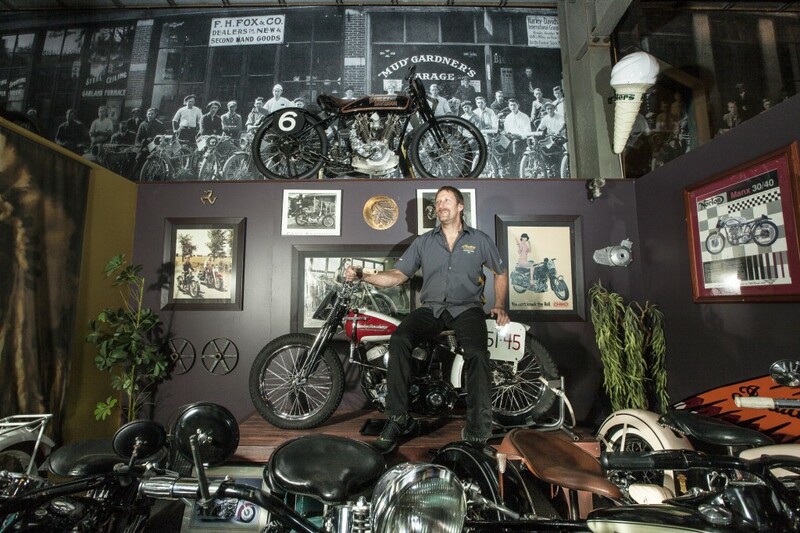 On one level that is true, as motorbikes have been an underlying passion since he was a boy, but the business angle is undoubtedly the result of many years of diversified, hard work. “I started off with nothing and I’ve still got most of that left!” he says laughing. “I left school and went straight into a motorcycle apprenticeship. I’ve worked in factories, in the construction industry, as a storeman – you could pretty much name it and I’ve done it – but they’re the kind of jobs where there’s work for a while, and then they go through a quiet period and they retrench a number of workers. 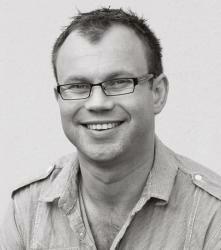 Even then, John still found himself at the mercy of the economy and external factors. He started a venture in maintenance contracting which generated good business, but he struggled with fluctuations in the economy and receiving payment from clients. He then started a panel shop and ran that successfully for some eight years before coming to the conclusion that it had run its course and it was time to look for something new. You’d be forgiven for thinking that John has been doing this all of his life. Throughout all of these ventures, John maintained his interest with motorbikes, regularly drawing on the skills and lessons learned from that original apprenticeship. Moreover, John was continually developing his own motorbike collection by using his skills to restore a bike and then selling it to get a better or more interesting model. “I might have kept a similar number but it felt like my collection was always evolving – and that’s a really important thing for me. One of the most important things in life is to evolve as a person. It’s this philosophy that makes John’s business such a success. He clearly loves the bikes he gets to work with, but he rarely gets so attached that he couldn’t let them go. John has a very diverse range of bikes and they all get used. 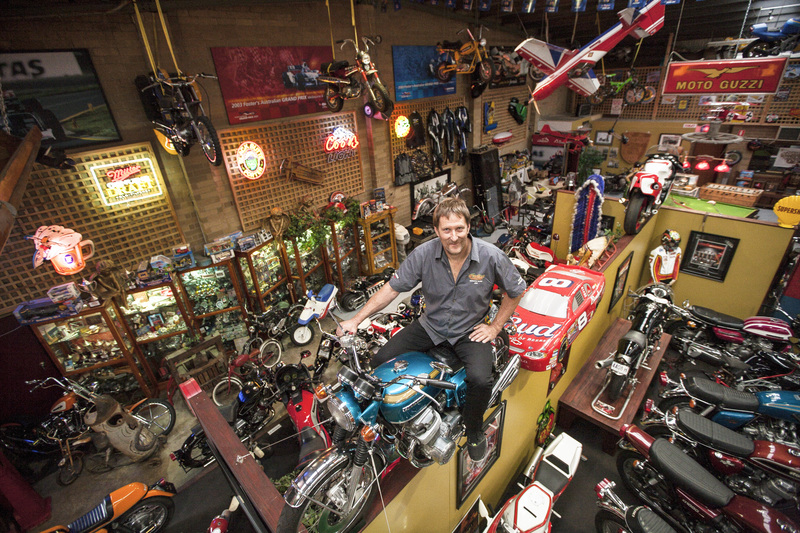 This same mindset applies to John’s personal bikes, with a collection that crosses the full gamut of road bikes, to dirt bikes, cruisers and more. Most importantly, they all get used. “Bikes are there to be ridden. Sure, there are some exceptions with specific historical pieces, but most people will never get their hands on one of those. I take the mindset that they won’t be much use to me where I’ll eventually end up! The same principle applies in the showroom, with John and his team constantly cleaning and polishing the bikes, checking the air in the tyres and regularly turning them over. Given the size of his showroom, it’s a very big job. It’s also only one part of John’s master plan. “I see this business as a wheel with spokes – and each spoke is a different element that works together to turn the wheel. There’s the showroom and the workshop as the basis of the business. But I’ve also got a club to get blokes together and go on runs so they enjoy their bikes. Then there is an importing arm to get bikes into Australia. And then I recently added a cafe so people who come to have a look at the bikes can sit down and enjoy a coffee or bite to eat. I’d then like to extend that to a full restaurant and also a merchandise shop where I could sell my own clothing label. Personally, I have full confidence he’ll get there. At first, you think it’s pure determination – heightened by his imposing physical stature – that will drive it along, but in no time you realise there is a whole lot more behind this man. Unquestionably he is a perfectionist who only sees value in taking something on if he can do it well and with logical strategy. John has a grand plan, which includes a restaurant and a merchandise shop. When you combine that trait with his desire to always learn and evolve as a person and in business, you have a very strong basis for success. Ultimately, it always comes back to the bikes with literally hundreds on offer from all parts of the world. “It’s great – I get to travel the world and source bikes for people back in Australia to enjoy,” says John. “I go to Europe, America, Japan, New Zealand and more. I find interesting bikes, put them through the workshop and make them safe and put them out for sale. Occasionally you have to do the left to right conversion…” he says pausing for the reaction, “but we don’t have too much trouble. Experience and evolution – they’re the two elements John has carried through his personal life and the basis for his business. You don’t go to Antique Motorcycles to buy a bike that will get you from A to B; you buy one that will offer an experience and the magic that comes from riding a classic bike. And when you’re ready to evolve, John will be waiting with the next bike.